The parka shall have a collar with a drawcord for adjustment and a stowed hood with visor, water resistant slide fastener front closure and underarm openings. 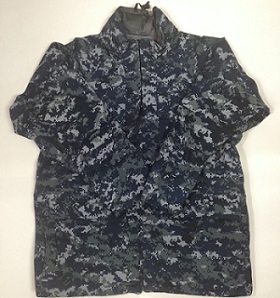 The parka shall have two upper chest pockets with concealed water resistant slide fastener openings, two lower pockets with flaps and concealed hand warmer pockets, adjustable wrist tabs, a rank tab, and waist and hem drawcord adjustments that are concealed inside the lower pockets. A hanger loop shall be located on the top edge of the collar. The parka shall have an interoperable inside front slide fastener which shall interface with liner. The parka shall also have snap attachment assembly tab located at the inside bottom of each sleeve as indicated on the pattern. The drawcords shall be anchored except for the waist adjustment drawcords. The basic material for the parka shall be a laminated, waterproof and moisture vapor permeable cloth.